When I first saw Planet of the Apes as a kid, I shivered when Charlton Heston encountered the top half of the Statue of Liberty jutting out of the sand at that disturbing angle. Liberty Enlightening the World––rotting away in the tide. That image has always stuck with me; maybe that's why I was surprised to see this photo (below) of Seattle's Statue of Liberty head, rising up at that same unsettling angle. (It's not a hot air balloon... it's just a big head.) Whatever the intended symbolism, I think it's totally hilarious... Decapitated freedom? I did a bit of research (because that's the kind of guy I am). 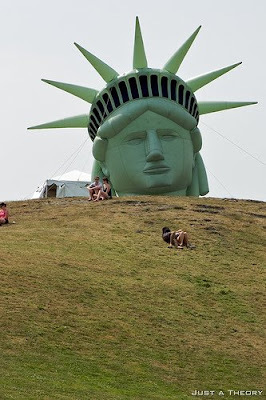 It turns out, one great Statue of Liberty head started it all. 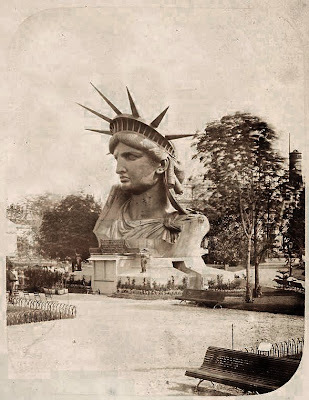 Before the original Statue of Liberty was ever shipped to the United States, its head was put on display during the 1878 Paris Exposition in the garden of Trocadéro Palace. 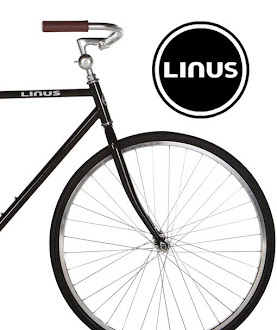 It could hold 40 visitors at a time.